The Euroscience Open Forum (ESOF) is Europe's biggest party of science bringing together more than 2,000 scientists, research institutes, business, science communicators and journalists. The event is also open to the public offering the opportunity to more than 20,000 visitors to learn more about science and relate to it. What brings together all these audiences is the quest for better science communication! ESOF's 3rd anniversary was celebrated in Barcelona (18-22 July) with the fancy title: 'Science for a better living', hosting more that 140 science workshops and outreach activities allowing scientists to share their latest discoveries and experiments with the public. But, reversing this year's slogan to 'Living with better science' also poses another big challenge for Europe's R&D actors. How is Europe using science to tackle daily policy concerns? Is Europe gradually becoming a knowledge society? Fusion For Energy participated by means of an exhibition stand in order to explain its mission, objectives and position fusion in the current debate of energy mix. A set of outreach activities was also envisaged in order to explore the laws of physics, the force of powerful magnets and imagine how future reactors will look like. Didier Gambier, Director of Fusion for Energy, acted as guest speaker at Tapas with Professors and discussed with eight young researchers the challenges that fusion research faces, the opportunities ahead and the importance of being proactive in making the right career choices in research. 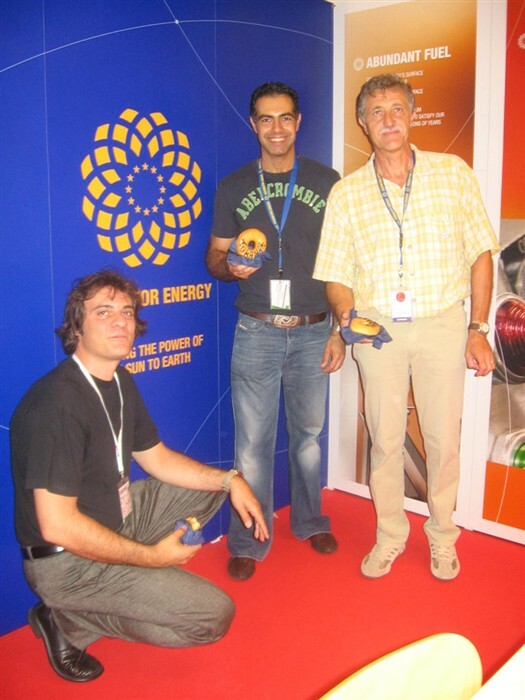 The fuel that kept us going through those five days was generated by a TOKAMAK.The famous doughnut reactor that will be constructed in the ITER project made a guest appearance in the form of a doughnut and kept the ESOF crowd talking with their mouth full. In some instances, it even inspired science communicators to publicly endorse it!